Resources - Call or write us for a copy! Wanting a baby? Not wanting a baby just now? Nature has provided every woman with a precise signal of her state of fertility, which she can quickly learn to recognise. This simple fact is the basis of the Billings Method, which has helped millions of women around the world to tune into their own bodies and achieve healthy, natural fertility control. Using the Billings Method you and your partner can be confident of knowing every day whether you are fertile or infertile, and so decide when to make love, depending on whether you want to achieve or avoid pregnancy. This book is a clear guide for all women, whether your cycles are regular or irregular, whether you are coming off the Pill, breastfeeding a new baby, or approaching the menopause. 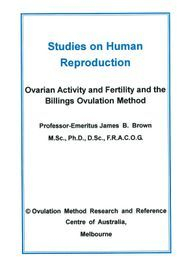 An essential resource for all Billings Ovulation Method® teachers and users of the Method. 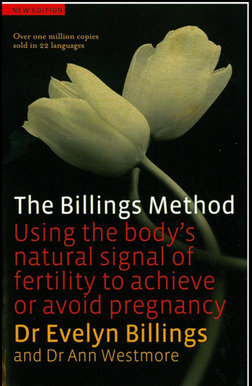 This booklet written by the founders of the Billings Ovulation Method®, Drs Evelyn and John Billings explains the phases of the cycle and the accompanying cervical responses which the woman can identify through the observation of vulval sensations and visual observations. Explains the Rules to achieve as well as avoid pregnancy. 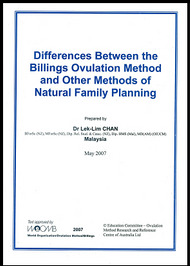 This booklet gives an overview of the differences between the Billings Ovulation Method® and a number of other methods of natural family planning. Good background reading for those who thought all methods were essentially the same. This booklet is for adults, those thinking of marriage, or those already married. 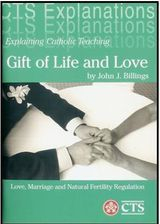 It explains many aspects of the rich teaching of the Catholic Church on love in marriage and responsible parenthood. It offers particular guidance on the Billings Ovulation Method as one of the most effective and widespread methods used successfully for the achievement or the postponement of pregnancy, - nurturing love, co-operation and understanding between husband and wife.